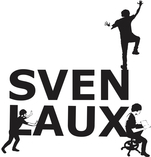 Sven Laux is a German electronic ambient composer and freelance sound designer based in Berlin, Germany. As a musician, DJ and film addict he has been developing his own unique style of modern classical music with a melancholy that on close listening becomes very uplifting. His music is peaceful, beautiful and relaxing with a twist of subtle and sometimes provocative noises. Using the sound of violins, cellos and piano as a framework, Sven‘s music feels deeply cinematic and could also be used in films of various genres. His soundscapes are like curvy streets – even safe for dreamers – built on emotion, melody and repetition leading to new perceptions. Sven takes his listeners on a journey. Being both, calming and exciting, each composition suits different moods but also several occasions and tastes. His artistic work is professionally backed by a SAE Institute Audio Engineering Diploma as well as a Datenklang Certificate in Sound Design. Besides on his own albums, the music of Sven Laux regularly appears on compilations. His album work, but also side projects and single works have been released on CD by various labels starting in 2017. Busy times ahead: new music, exciting projects and some little surprises. A lot to explore.